It’s late into the evening and Tom is tucked into bed. The blankets wrapped around him have formed a cocoon, and there’s no sign of him moving or waking up until the next morning. He closes his eyes and falls asleep. Within hours, a small flame from a candle left in the bathroom catches the shower curtain on fire. Tom is fast asleep. He can’t smell the fire, and he doesn’t wake up. He doesn’t have a clue of the present danger until the smoke alarms in his home sound off to alert him of the deadly fire situation. Within moments all five of the interconnected smoke alarms in the home are chirping away. Tom wakes to flee the house and wait for fire responders. He’s safe and alive thanks to the job of his smoke alarms. Though this is a fictitious story, the details are all too common. Every year people across the country are saved from deadly fire situations after being alerted by their smoke alarms. Fires are often start from small—they’re commonly accidental incidents—but in the modern home they spread rapidly. According to a study by Underwriters Laboratory, modern homes burn up to eight times faster than comparable homes that were built between 1950 and 1970. This is due to quicker fire propagation, causing slower escape times, quicker flashover time (all combustible materials in a room reach their ignition temperatures at the same time), and shorter collapse times. Modern homes are also made out of synthetic materials and decorations that burn faster. This short time span alters reaction time, changes firefighter strategies, and exacerbates fire situations. During a fire incident, you have an average of three minutes to escape the home, but it takes firefighters six minutes to arrive at a fire scene. This means it takes responders double the amount of time you are allotted to escape, so relying on firefighters for safety won’t be an effective strategy. Smoke detectors are crucial to being alerted as soon as possible, and provide as much time as possible to escape a home. Fast Fact: According to Time Magazine, Duane D. Pearsall invented the smoke alarm in 1965. She created a home version that was affordable and powered by a single battery. This happened 75 years after the first electronic fire-alarm system was invented. There are two common types of smoke alarms. Photoelectric: these alarms detect smoldering fires quicker, and are often recommended because they are less likely to sound nuisance alarms. This means they will also be less likely to be disabled by a frustrated homeowners who doesn’t want to deal with nuisance alarms. These are the more expensive smoke alarm option. Ionization: These alarms are best at detecting fast flaming fires. These fires are most common when homeowners are asleep, the fire occurs unexpectedly, and homeowners need to be alerted immediately. Both types of alarms are suggested to be used in the home, and a combination of the two together will be the most effective. 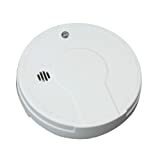 The CPSC (Consumer Product Safety Commision) suggest installing interconnected smoke alarms because they are the quickest to work and alert residents during a fire emergency. CPSC also says that situations where smoke alarms were on all floors meant they sounded in 37% of fires, alerting occupants 15% of the time. Instances where alarms weren’t on all floors, they only sounded 4% of time and this resulted in alerting occupants only 2% of the time. 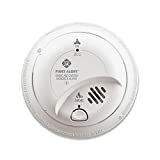 Homes that had interconnected smoke alarms sounded in over half of fires (53%) and alerted people in one-quarter of the fires (26%). Before purchasing an alarm, make sure it is labeled to have been recognized by a credible testing laboratory. CO Detectors, temperature sensors, and other disaster sensors provide additional aid. Have all the proper preventative measures in place, including an emergency escape plan for family, children, and older adults. They also found that in 46% of the fires where a smoke alarm didn’t work properly, it was due to missing or disconnected batteries, and dead batteries entirely caused 24 percent of the smoke alarm failures. The most crucial aspect of smoke alarms is to properly install them for homes and family. This is the first and most important step to make sure that you’re protected. This includes knowing how many alarms should be placed in a house and where. At minimum, smoke alarms should be installed in every sleeping room, outside of each sleeping area, and on every single level of the home. Larger homes will need more smoke alarms, and many older homes come furnaced without meeting safety requirements. The more smoke alarms you have, the quicker you’ll be alerted of an emergency, meaning more time to escape a dangerous situation. If a level of the home does not have a bedroom, install the alarm in the living room or family room, and place it near the stairs to the upper level or in both places. Smoke alarms in basements should be placed on the ceiling at the bottom of the stairs that lead to the next level. Alarms should be 10 feet (three meters) away from cooking appliances. You don’t want false alarms while you are cooking. When mounted on walls and ceilings, alarms should be mounted high, because smoke rises. Alarms that are mounted on walls should be no more than 12 inches away from the ceiling to the top of the alarm. If alarms are being mounted on a pitched ceiling, they should be within three feet of the peak but not within the apex of the peak (four inches down from the peak). Never install alarms near windows, doors, or ducts where an air draft can interfere with their operation. This includes kitchens, ovens, cooking appliances, doors, and anywhere that sends temperature drafts. Don’t ever paint a smoke alarm or tamper with it in any way. Adding paint, stickers, or any other sort of direction can keep it from working properly. Everyone in the home should be familiar with how a smoke alarm sounds when they are going off so they know how to respond to an event. Follow all of the instructions on your devices from their instruction manuals. This includes cleaning and proper maintenance. If you’ve lost your owner’s manual, the company will send a new one or you can find it online. These detectors don’t work in extreme temperatures—hot or cold—in areas prone to dust, and near kitchen or places that get other drafts are not recommended. Most smoke detectors come with the paperwork that tells their temperature ranges. Don’t use alarms in garages. Garages aren’t heated or cooled, so the temperatures are infrequent and do not meet the standard ranges for smoke devices. Best Installation Approach: Connect all smoke alarms together, so that if one goes off, they all go off together. 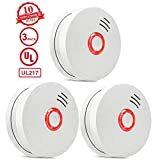 This is available for hard-wired and wireless technology but the alarms should be from the same company so there is a guarantee they are compatible to work together. Most Important: Make sure that you have enough smoke alarms in a house. This is suggested because fires are believed to spread more rapidly in homes today than in the past due to the many natural products and materials in a home. All smoke alarms should be tested once a month at minimum. This is as easy as pressing the test button to make sure that the alarm is working. Smoke alarms should be replaced entirely after ten years, and batteries should be replaced twice a year, the common suggestion is to change batteries whenever you change the time of your clocks. There are smoke alarms that are manufactured with batteries that don’t need to be replaced for ten years. If you own one of these alarms and you begin to hear warnings (chirps) that the batteries are low—replace the entire system right away. All other alarms should have batteries replaced once a year, but you should abide by owner’s manuals for proper protocols and to install the right batteries. It should be noted that some research suggests that kids don’t wake up the sound of smoke alarms. This research does not take away from the fact that smoke alarms are the most effective way to reduce the number of injuries and deaths due to fires. The NFPA themselves have noted these concerns, and they stand by their research that alarms are vital to saving lives. For further reading on smoke alarms, visit our definitive guide to the caring and feeding of a smoke detector and our literature on false alarms.